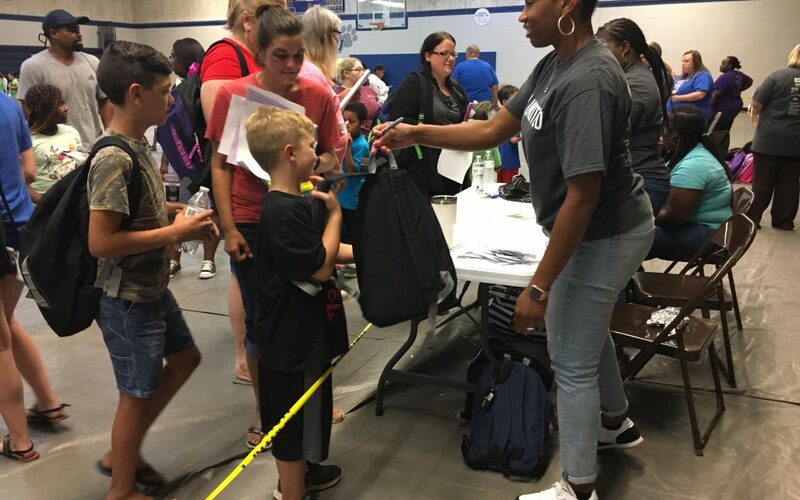 (Coushatta, LA) – More than a thousand Red River Parish residents showed up for United Way NWLA’s second annual Red River Parish Back to School Bash. This event is the only in the parish to distribute school supplies. According to the ALICE (Asset Limited Income Constrained Employed) Study of Financial Hardship, 48 percent of Red River Parish residents are struggling to afford basic needs. The annual Back to School Bash is helping to fight and reverse this statistic. This year, United Way NWLA and Red River Parish Schools secured enough sponsorships and donations to provide each enrolled student with a set of supplies and K-8 students with brand new backpacks. Registration numbers from Mondays event show 740 of the 1,350 students enrolled with the school district attended. An improved layout was used this year in order to better accommodate everyone in attendance. It took the space from both Red River High School and the junior high school campus to pull off the bash. The arrangement included registration in the cafeteria, uniform pickup in the library, food and community vendors in the junior high school gym and the supply giveaway plus free haircuts in the high school gym. “We understand the need for resources in Red River Parish and United Way of Northwest Louisiana is committed to supporting the educational development through the Back to School Bash and Imagination Library,” said Bruce Willson, CEO of United Way NWLA. This event marks the first year since United Way NWLA and BHP made the Imagination Library program available to all children under five years of age in Red River Parish. Imagination Library sends free, high quality, age appropriate books to children each month they’re enrolled. A report shows 54 percent of enrolled Red River Parish kindergartners are not prepared for school. The program addresses early childhood literacy and help children become kindergarten ready. More than 110 Red River Parish children have signed up during the past year. United Way NWLA and Red River Parish Schools thanks the following visionary and champion sponsors: Bank of Coushatta, Bierden Co., G & B Works, LLC and Louisiana Healthcare Connections.